Meet Harold – a rather grumpy and distinctly overweight brown bear who’s exceedingly fond of his creature comforts. Somehow – don’t ask him how, he has no idea – he always found himself being tipped into someone’s smelly rucksack at the start of these damned walking holidays. He used to complain loudly, squashed up between yesterday’s balled-up hiking socks and the used blister plasters, and then console himself by rifling through the emergency chocolate until it appeared that a plague of locusts had been at work. But, as the years went on and Harold quite unintentionally got more and more miles under his belt (that’s the belt which has needed several extra holes) he found he actually started to rather enjoy this walking lark. He’s learned to take the positives from it – that a hot bath, a nice meal, a bottle of wine and a comfy bed never feel and taste quite as good as they do after a day of really hard graft. Now he’s become quite a connoisseur of the upscale bed and breakfast, the seaside bistro and the cosy village pub. 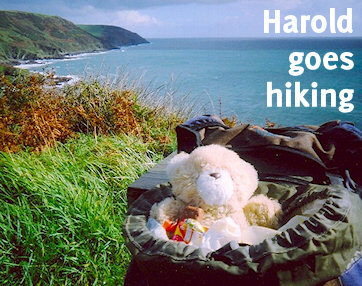 He comes along at his own suggestion – just as keen to get round the old South West Coast Path as we are, although he’s aware he’ll be far from the first bear to have done it.